This article will begin with a general overview of what the Camp Chef PG24DLX grill has to offer, followed by a section dedicated to its specifications. A portion of the article discusses some of the advantages and issues with the grill, followed by pros and cons. Finally, it looks at some issues brought up by online reviews along with potential solutions. Grilling for the family and for guests does not have to be a difficult chore. Wood pellet grills such as this Camp Chef choice provide modern digital technology coupled with wood cooking. This grill provides plenty of cooking surface as well as options for cooking styles. It is these features that will be highlighted in this review. This wood pellet grill offers users a chance to prepare meat in a variety of ways using wood for a natural flavor and heat source. Unlike some pellet grills, the Camp Chef PG24DLX maintains a more accurate temperature thanks to the smart digital temperature control system. Grill and meat temperatures are constantly monitored while the automatic auger feds the correct amount of pellets to provide the heat and smoke it is set for. This product provides enough cooking surface to keep backyard events well stocked with flavorful meat at all times. The digital controls are user-friendly, and new grillers will be barbecuing and grilling right away. Seasoned grillers, as well as less-experienced users looking for a new challenge, will appreciate the versatility offered by this grill. Operators can bake, barbecue, braise, grill, roast, and smoke their chosen meats while maintaining temperatures within a 20-degree margin with multiple sensors. An Inexpensive Option: Camp Chef offers this grill at a competitive price. Other brands will offer a similarly sized grill at twice this grill’s price point. The Easy To Clean Design Features: The Camp Chef PG24DLX has an interior design that allows fats and grease to move towards the center. Afterward, they slide down towards an opening near the bottom of the body. From there, these materials pour into an exterior bucket that can be dumped when needed. Camp Chef also makes use of a patented ash cleaning system for this grill. It is easy to use with just a pull of the lever. It Has Multiple Grilling Levels: The Camp Chef PG24DLX provides a total cooking surface that reaches over 570 square inches. This is divided into a grilling surface of 429 square inches, with a warming rack making up the difference. This feature provides more options while grilling. The Grill Has Multiple Cooking Options: A variety of cooking options is possible with the Camp Chef PG24DLX including baking, barbecue, braising, grilling, roasting, and smoking. The multiple rack levels aid in this process. So does the temperature range from 160 to 500 degrees Fahrenheit. A Chimney Provides Venting: A feature not found on many grills is Camp Chef’s chimney design. It is located along the top of the housing and near the rear. This location keeps it out of the way of the hinged lid and provides a covered opening for the smoke to exit from. Design And Material Concerns: The grill is made of a certain steel alloy that is lighter than other grills are built out of. This trade-off allows the grill to be offered at a lower price point. Alignment issues may develop with lid, as it may not sit properly without help. The lid on the grill is thin and is attached to the body with two hinges. The lighter weight and hinge design can cause alignment issues when attempting to close the grill. Closing the lid slowly while paying attention to how it rests should prevent heat and smoke from leaking out from under difficult lids. Moving on, there are also a few reviews that mentioned receiving defective parts upon delivery of the grill. On the other hand, a majority of customers appear to not have this issue. They wrote reviews expressing positive experiences with shipping and assembly. It should be noted that most updated posts about defective parts indicated that they received replacement parts through the mail from the company. It could take a few days for the parts to be delivered, as the company is not based in the United States. The Camp Chef PG24DLX grill provides more than wood flavoring. It offers a variety of solutions for users catering to family and friends. 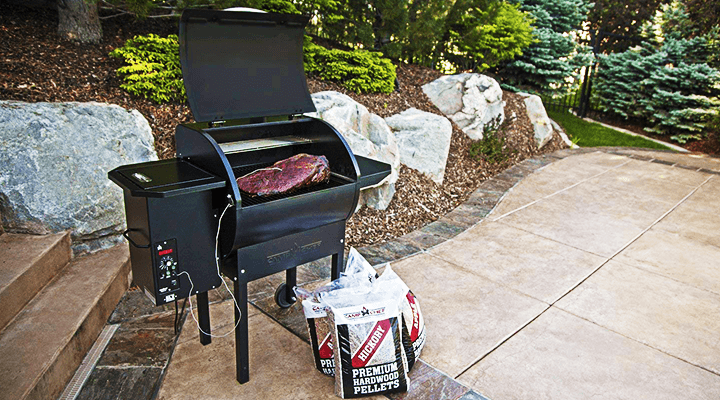 We’d love to hear about your experiences and suggestions with this pellet grill! This grill is a good deal given the grilling surface size. I like the chimney ventilation at the rear of the grill too. It’s a nice feature. Not sure any cons stand out. I’m looking for a grill and will consider this one. Hey, Amos, glad to see our reviews are helping people. Like our Facebook page to stay updated to the latest news in the grill industry!